Für the light tank, siehe M2 Light Tank. 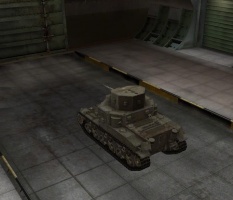 Der M2 Medium Tank ist ein amerikanischer mittlerer Panzer der Stufe 3. Der einzige mittlere Panzer, der von der US Army in der Zwischenkriegszeit übernommen wurde. Das Fahrzeug war mit einem 37-mm-Geschütz und sechs 7,62-mm-MGs ausgestattet, vier davon in drehbaren Feuereinheiten. Die beiden nicht-drehbaren MGs wurden in der Vorderseite der Wanne angebracht. Trotz unscheinbarer Kampfleistung wurde der M2A1 von Beginn an ein Meilenstein in der amerikanischen Panzerentwicklung, da er einfach für die Serienfertigung angepasst werden konnte. Im Jahr 1940 wurden 94 Fahrzeuge gebaut. It has the improved 37mm and a very powerful 75mm howitzer, which requires the M2M7 turret. At first, with the 37mm, the M2 can feel a bit handicapped fire-power wise. Once armed with the 75mm howitzer, it is a force to be reckoned with. This, coupled with its good mobility, makes the M2 a fun tank to play and the grind to M3 Lee should be quick and painless. 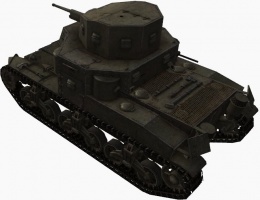 Der M2 Medium Tank führt zum M3 Lee. Firepower wise when equipped with the 75mm howitzer, the M2 Medium tank shines. 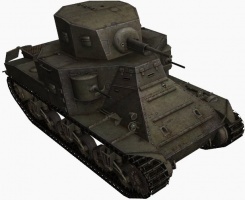 It can one shot or heavily damage most tanks its tier and below, and have some capability of fighting higher tier tanks frontally (Although flanking is always the best choice.) The 75mm HEAT shell has enough penetration to hurt most tier 5 vehicles with good aim. The M-6 37mm gun does offer upgraded penetration, accuracy, and rate of fire, but at Tier 3 these traits are negated by the rather low damage per shot versus the raw damage the 75mm gun offers. The gun depression is extremely excellent, allowing the M2 MT to take up very effective hull-down positions, which is extremely important. In a tier 3 match this will allow you to bounce most small caliber fire. 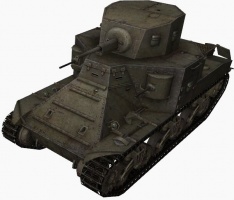 Armor wise, it has decent frontal armor, but with the second turret being an open top, it becomes very vulnerable to enemy arty and HE (most notably, enemy M2 MT's), so avoid slugging fights where possible and try to end them quickly with the 75mm gun, or your low reload speed may put you in a situation where you will be outgunned quickly by faster firing enemies or their artillery support. Also be aware that the MG ports are large weakspots. One interesting thing to note is that this tank is the poster child for the Relaying skill. It has the highest signal range for tier 3, excellent view range, and it has two Radio Operators. Tier 3 is low enough that your team can genuinely benefit from Relaying skill. 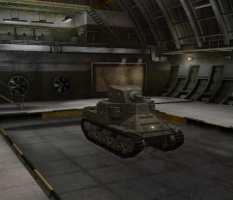 However, since this is still a medium tank, it is not well suited for actively scouting behind enemy lines. Instead, stay back a bit and let the Relaying skill passively boost the signal range of everyone around you. Also of note is that with Binocs, you can have the maximum allowable view range at tier 3. 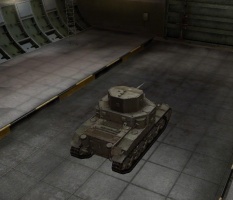 This can be quite powerful on maps like Province and Malinovka, and allows you to passive scout even in a tier 5 match. When bottom tier, act as a support tank. Take flanking shots and support bigger allies. The SCR 210 and SCR 506 radios carry over from the T2 Medium Tank and can be installed immediately. 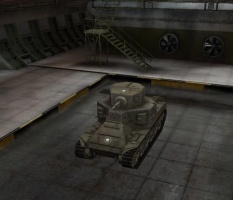 First research the turret for improved frontal armor and much improved view range. Next research either the 37 mm Gun M-6 or the 75 mm Howitzer M3, depending on you wanting damage and derpeffect or RoF and penetration. You don't need more weight capacity, but get the upgraded suspension for the improved traverse speed. 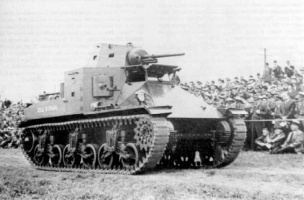 The Medium Tank M2 was a United States Army tank that was first produced in 1939 by the Rock Island Arsenal, just prior to the commencement of the war in Europe. Production was 18 M2 tanks, and 94 slightly improved M2A1 tanks, for a total figure of 112. The M2's unique features included an unusually large number of machine guns, bullet deflector plates, and sloped armor on the hull front (glacis plate). The main armament was a 37 mm gun, with 32 mm armor. The M2A1 had a 51 mm gun mantlet. For combat it was a poor design, with thin armor, inadequate main armament and a high profile. The four sponson-mounted machine guns proved to be completely unnecessary. The M2 was already obsolete when it entered service. It compared poorly with the latest European tanks, such as the French S-35, German Panzer III and Soviet BT-7, which could easily withstand 37 mm hits. The 37 mm main armament of the M2 was equivalent to the 37 mm in the Panzer III, but the BT-7 (45 mm) and the S-35 (47 mm) had more powerful guns. By 1941, Germany had upgunned the Panzer III with a 50 mm L/42 gun, and the Soviets had fielded the vastly superior T-34, with a 76 mm gun and a sloped 52 mm glacis plate. Given this, the M2 was essentially a stopgap measure until more capable tanks like the M3 Lee and M4 Sherman came along in 1942-43. Although 18 M2s and 94 M2A1s were produced, the Ordnance office recommended in 1942 that they should only be used for training purposes, and they were never sent overseas to combat areas. An M2A1 Medium Tank (late production series). a M2 medium tank, used in World War II by American forces. 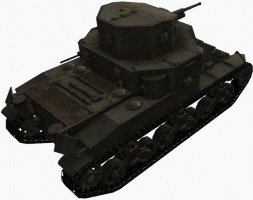 The only changes to the M2 Medium Tank were an enlarged turret, automotive improvements and thicker armour. There were no plans to replace its original 37 mm gun. One of its historical turrets, the early M2, is missing. It can be distinguished by its sloped appearance. One of its historical armaments, twin 37 mm M2A1 guns, are also missing. This experimental configuration was known as the T5 Phase I (Early). Chamberlain, P. and C. Ellis, 2000, British and American Tanks of World War II: The Complete Illustrated History of British, American and Commonwealth Tanks 1939-1945, Cassel Reprint, London, 224p, ISBN:9780304355297. Hunnicutt, R.P., 1976, Sherman: A History of the American Medium Tank, Presidio Press, 572p, ISBN:9780891410805. M2 Medium Tank Photos & history. Diese Seite wurde zuletzt am 25. Oktober 2016 um 13:23 Uhr geändert.